You know, we are willing to bet that on first glance of those names, you are thinking: who the hell are these guys? 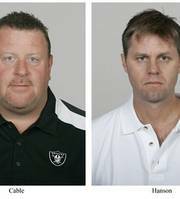 Well, Tom Cable is the head coach, while Randy Hanson is a defensive assistant for the Oakland Raiders. Reports have been looming, and now the NFL is investigating, that Cable punched Hanson in the jaw. Let’s be realistic – is anyone really shocked? This is, after all, the Oakland Raiders. The same team that had Lane Kiffin as a coach who was fired for insubordination and lying (no different than what he does at Tennessee now). The same team that had Bill Callahan as coach who called his team “the dumbest team in America” in 2003. Oh yeah, they had Randy Moss, too. Regardless, we are going to go ahead and put Tom Cable up there with Michael Crabtree as biggest idiot of the year. Again, one word for this: FAIL. You are currently browsing the archives for the Randy Moss category.